Well, I seem to be developing a habit of posting on the last day of the month. It always comes up faster than I expected and I feel like I'm racing just to get this in before the month is over. I'll try to be better about that. As I read through my last update from March I realized that I forgot to mention one particularly special and memorable experience. Ever since I started speaking about the accident and how an acquired disability has changed my life there have been two groups that I've wanted to speak to but have either not had the opportunity or, as in the case of high school students, have had very little opportunity. Those two groups are high school students, and students in the HTM (Hospitality and Tourism Management) school at Purdue. High School students because it was a 16 year old who caused the accident that led to the loss of my legs, and Purdue HTM students because that is my Alma Mater. During Disability Awareness Month (March) I finally had the chance to speak at Purdue. Like most college campuses, you need a parking permit to park on campus at Purdue. When I was a student, I had a good enough relationship with the faculty in the HTM school (back then it was RHIT, which stood for Restaurant, Hotel, Institutional, and Tourism Management; so glad they shortened the name) that I could get away with parking my car by the dumpster behind the building and not get a ticket. Once I realized this, I made a habit of driving to campus whenever I wanted. I'd park my car behind Stone Hall (the building that held the RHIT department), enter the building through the loading dock entrance behind the kitchen, and go about my day. In the years since I regularly walked (and illegally parked) :) on the campus Purdue has built a new building, Marriott Hall, for the HTM School. Dr. Mick Lalopa, who began teaching at Purdue during my senior year, asked me to come speak to his Human Resources class about my experience both as a manager in the hospitality industry and a person with a disability. As I drove up to Purdue I began to feel a bit nostalgic about Stone Hall, and the fact that I would not get to park by the dumpster and walk through the back halls like I owned the place, the way I had so many years ago... As I approached the campus I called Mick to let him know that I was getting close and to find out where I was supposed to park. A huge smile lit up my face as he told me to park by the dumpster behind the building and come in the back door which, ironically, is right behind the kitchen. It was just like old times! I felt so honored to have the opportunity to speak to the students at my Alma Mater. The class was a great audience and asked very intelligent questions. After the class was over a students few stayed back to speak with me for a moment, and then I was given a tour of the great new building. During the tour I got to catch up with a few of my old professors, and Mick gave me a picture he had found in his old office when they moved to the new building. 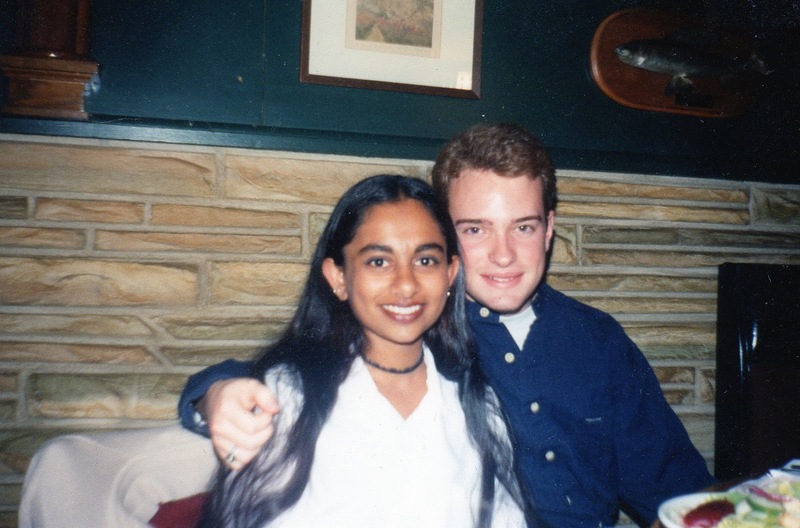 The picture is of my dear friend Preeti (whom I was head over heels in love with, but was too much of a coward to say anything until it was too late) and I at some type of casual function during our senior year. Two things cross my mind as I look at this picture: One, I was a fool to let her slip away, and two, what happened to that jaw line?! Each group of students had read a text about a woman who lived with a congenital neuro-muscular disorder who had become an attorney and disability rights activist, and a text of an interview with a person who felt that expecting parents whose unborn children were diagnosed with a severe disability should abort the child...for various reasons...reasons that caused the hairs on the back of my neck to raise. (I can't believe there are actually people out there who feel that such practices are acceptable, and yet, it happens.) I was truly impressed with how the students looked at both points of view, the arguments they raised, and how they handled themselves during the discussion/debate. It was an honor to take part in the discussion with them! The one class that didn't have the Socratic discussion was AP Chemistry, and due to the design of the building, it just made sense for me to sit in on that class as well. Before the class started the students were asking about my legs and the teacher asked me to share a little bit of my story with them. Then the teacher put a formula on the screen and I looked up and said "hey, I can tell you that's salt...but I have no idea what the rest of those characters mean." Now I know why I didn't take AP Chem when I was in High School 20 years ago. I wasn't really involved in this class, but I tried to pay attention just to see if I would understand it at all. My head started to hurt after about ten minutes. For the most part I tried to stay quiet, but every once in a while the teacher would ask if everyone was understanding it and I, of course, would make a comment about being thoroughly lost! When I received a stack of thank you cards from the students, I was surprised to find one that said "you almost made AP Chem fun!" The month ended with a visit from two of my closest college friends. Jason drove up from Corydon, IN on Friday night and Rob came down from New Carlisle, IN on the same night. Jason got in around 8pm and Rob arrived around 10pm. Rob had said that he would be crashing as soon as he arrived, as he was tried from a day of work and the drive, but of course we stayed up until about 3am catching up on the year or more that had passed since we three had been together at the same time. The purpose of their visit was to assist me with things around the house and yard that I didn't want my parents to take care of. Mom and Dad have enough projects to deal with at their own house and I was also looking for a way to get these two friends, who are in the same State but at opposite ends, to visit me in the middle of the State at the same time. (Yes, I have to come up with heavy projects to get my friends to come for a weekend.) They are both married and have multiple children, so I recognize what a huge sacrifice this was for them to be away from their families for the weekend. After they left on Sunday to return home I called both of their wives to thank them again for letting me borrow their husbands.